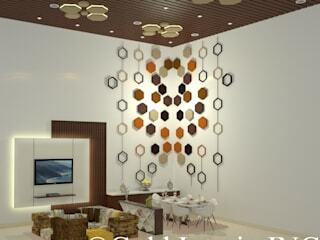 Gold Interio Inc. is one of the premier Interior Design Studio which has evolved to turn dreams into reality. Space planning is the foundation of all our projects. The function of a place is being worked out before beautifying it. Principals of balance, scale, harmony, proportion, colour, texture, rhythm, light and form are all considered in each of our projects. We suggest to clients our design concepts as we work together, allowing them to make optimized decisions for a better creation. The final decision is always up to the client, but we believe sharing our knowledge and expertise which help them make the right choice. Our Team here comprising of Interior Designers, Technologists and Executors having an obsession for distinctive interiors believe in Transforming Spaces & Ambience for People Exception Design for Exceptional People Elegance the way Turning thoughts into reality It may be a single element or a complete space, Gold Interio Inc. takes on the challenge and helps make the road less stressful and more enjoyable as we love what we do and are dedicated to serve the best that's why we are the best interior designer in Delhi. If looking for the solutions to the needs in Interior Designing, Renovations, Decorating Assistance and related services, look no further than Gold Interio Inc. As we provide exclusive services from Consultancy to Execution in Delhi , Faridabad , Ghaziabad , Gurgaon , Noida , Greater Noida.